Despite being in the red since its launch three years ago, Shinsegae announced it will be investing 300 billion won ($264 million) over the next three years into its convenience store business, rebranding it from Withme to Emart24, redesigning its stores’ layout and introducing private label products. Withme was launched in 2014 by Shinsegae -- which runs shopping malls, department stores and discount retailers -- with 100 percent of its shares owned by E-mart. Withme CEO Kim Song-yong speaks to reporters at Coex in southern Seoul on Thursday. Now, with over 2,100 stores, Kim says the convenience store chain has grown to a level where it could create synergy with the E-mart brand. Last year, the company’s sales reached about 378.3 billion won -- a figure that Kim hopes to nearly double to 700 billion won by the end of 2017 with the new strategy. The “24” in Emart24’s name represents the 24th anniversary of E-mart celebrated this year. To renew the brand, stores will be redesigned, while private labels launched by E-mart such as No Brand and Peacock will be brought in. The redesign will “shift” the typical layout of a convenience store since the first 7-Eleven was first brought to the country in 1989. For example, the checkout counter in the center of the store will be like a service desk rather than up against a wall, Kim said. The revamped stores have been test-operated at Starfield Coex Mall and the Seoul Arts Center, which has led to their sales doubling the average of other branches. 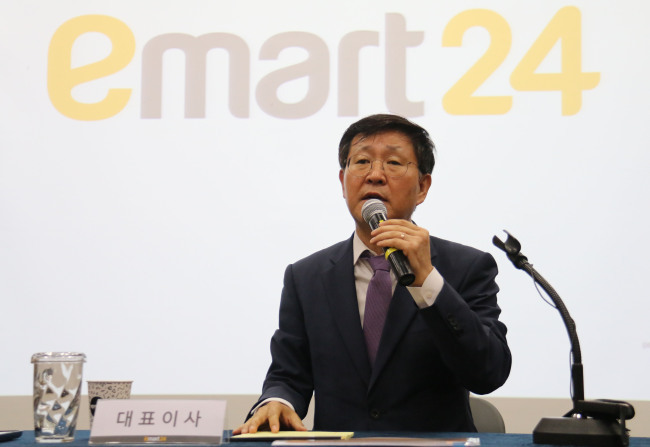 Emart24 will also continue its unique relationship with its franchisees, Kim said. Withme has been charging its franchisees only a membership fee rather than royalties based on sales, to allow franchisees to choose their operating hours instead of the standard 24-hour system, and to remove penalties charged for breaking or changing the franchise contract before the end of the contract period. In addition, Shinsegae will start a new system for prospective franchisees concerned about the financial risk by offering to directly run a store for six months to a year and release sales numbers before signing a contract. The company will also introduce a so-called “pay-back” system through which franchisees will be able to receive a 1 percent rebate on orders of products for their stores. “The rise in labor costs and real estate costs is leading to a delay in reaching the break-even point,” he said. Kim projected that Emart24 would need to reach 5,000 to 6,000 stores to reach the break-even point and begin turning a profit.